Having learned of the discovery of the first watch ever worn on the moon, prestige Swiss watchmaker OMEGA is pleased to announce that it is willing to acquire this historically significant Speedmaster. The first Speedmaster to be worn on the moon had been lost for over 30 years, after it went missing from a shipment sent as a loan to the Smithsonian Institution in Washington D.C. Recently, the watch in question has been found in the possession of a businessman in Long Beach, California, who purchased it in 1991, unaware of its origin. It was only when the buyer began to take an interest in the history of his timepiece that he discovered its serial number matched that of the Speedmaster issued to one of the Apollo 11 astronauts. 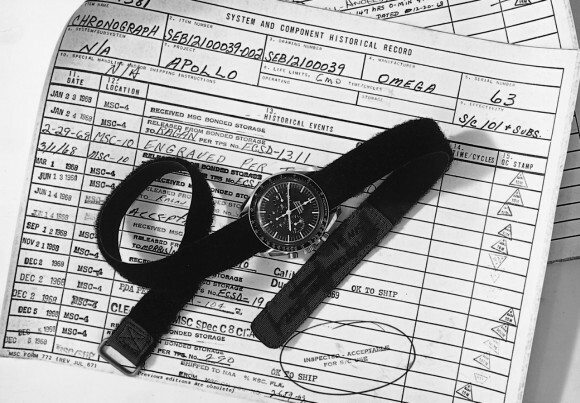 The OMEGA Speedmaster was the only chronograph to pass all of NASA’s strict homologation tests in 1965, when the American Space Agency was looking for a chronograph as standard issue for its astronauts. As such, it is no surprise that the first watch to be worn on the moon is still working perfectly over 30 years after it was first issued by NASA. Even today, the Speedmaster Professional Chronograph remains one of OMEGA’s most popular models. OMEGA is very interested in acquiring this unique Speedmaster, which would take pride of place at the company’s museum together with numerous other treasures including Lawrence of Arabia’s pilot watch and Salvador Dali’s Prémonition des Tiroirs. This entry was posted in Press Release, Speedmaster Professional and tagged Richard R. Gordon on October 23, 2003 by Dale Vito.